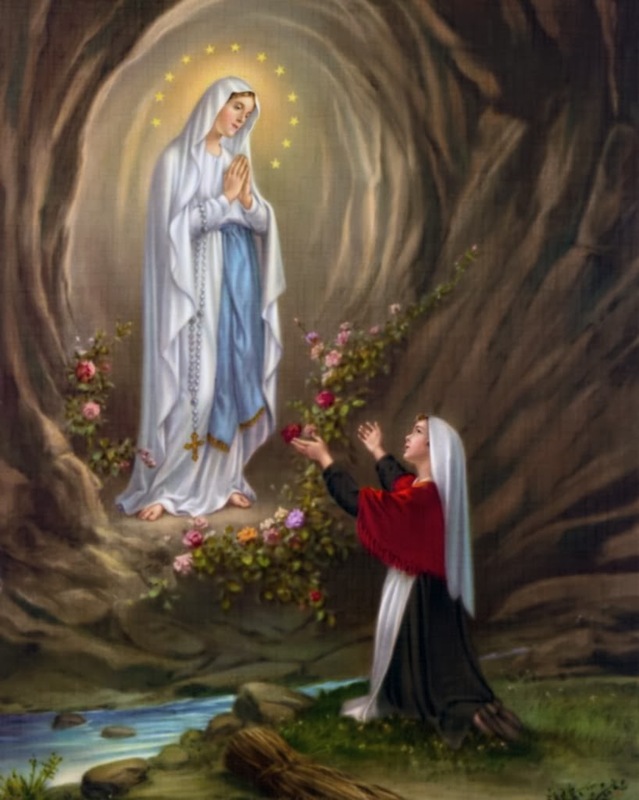 Be blessed, O most pure Virgin, for having vouchsafed to manifest your shining with life, sweetness and beauty, in the Grotto of Lourdes, saying to the child, St. Bernadette: "I am the Immaculate Conception." A thousand times we congratulate you upon your Immaculate Conception. And now, O ever Immaculate Virgin, Mother of mercy, Health of the sick, Refuge of sinners, Comforter of the afflicted, you know our wants, our troubles, our sufferings; deign to cast upon us a look of mercy. By appearing in the Grotto of Lourdes, you were pleased to make it a privileged sanctuary, whence you dispense your favors, and already many have obtained the cure of their infirmities, both spiritual and physical. We come, therefore, with the most unbounded confidence to implore your maternal intercession. Obtain for us, O loving Mother, the granting of our request. (mention your request) Through gratitude for your favors, we will endeavor to imitate your virtues, that we may one day share your glory. O Brilliant star of purity, Mary Immaculate, Our Lady of Lourdes, glorious assumption, triumphant in your coronation, show unto us the mercy of the Mother of God, Virgin Mary, Queen and Mother, be our comfort, hope, strength, and consolation. Amen. O glorious Mother of god, to you we raise our hearts and hands to implore your powerful intercession in obtaining from the benign Heart of Jesus all the graces necessary for our spiritual and temporal welfare, particularly for the grace of a happy death. O Mother of our Divine Lord, as we conclude this novena for the special favor we seek at this time. (mention your request) We feel animated with confidence that your prayers in our behalf will be graciously heard. O Mother of My Lord, through the love you bear to Jesus Christ and for the glory of His Name, hear our prayers and obtain our petitions. O God, Who by the Immaculate Conception of the Virgin didst prepare a worthy habitation for Thy Son: we humbly beseech Thee, that we who celebrate the feast of the Apparition of the same holy Virgin, may obtain health both of soul and body. Through our Lord Jesus Christ Thy Son, Who liveth and reigneth with Thee and the Holy Ghost, one God, world without end. Amen.